While there’s nothing wrong with buying meals, after a while that can get expensive and could affect your health and healing progress, if that’s something you’re working on. It’s also hard to ensure wherever you’re going, if they’re cooking with quality oils or ingredients. That can be key for anyone working to improve their health. So, if you’re still going to cook your own meals, how are you going to do that AND all the other things in your life? Take a moment at the end or beginning of your week and look at what you’ve got going on and see if you have an open space to prep or batch cook a few meals so you can feel more prepared to face the rest of your week. Plan what you’re making ahead of time so during the week you can focus on what you need to focus on and not worry about what’s for dinner tonight. Once you have that plan in place, make a grocery list and get all the things you need in one trip, so you’re cutting down on extra trips and can have more time for all the other things you’ve got going on. If you don’t meal prep already and have an open day in your schedule, see if you can meal prep a few meals, especially if you know you’ve got busier days coming up where you won’t have time to cook. Cooking a few or all the meals you need for the week could take a load off during the week and help reinforce your healthier eating habits because most of the work is done for you. Batch cooking, or making double or triple of what you need and saving it for later, can also be a great gift for the future. You can freeze these meals or just have more of the same thing during the week. You can easily double any of your favorite recipes and see how that works for you. If doing all of your meals is a bit much, start with a few here and there or ask for help. Prep with a friend or partner to make the prep process go by faster. In addition to meal prepping, you can take some shortcuts in getting your meal together to cook. You can use a slow cooker or Instant Pot to make the actual cooking easier and more hands off. You can also buy some healthier “convenience” foods, like pre-cut or spiralized vegetables, frozen vegetables, salad greens, rotisserie chickens, or pastured/grass fed sausages to help speed prep up. Your dinner doesn’t need a lot of different ingredients or fancy techniques. It can be a few ingredients, seasoned well. 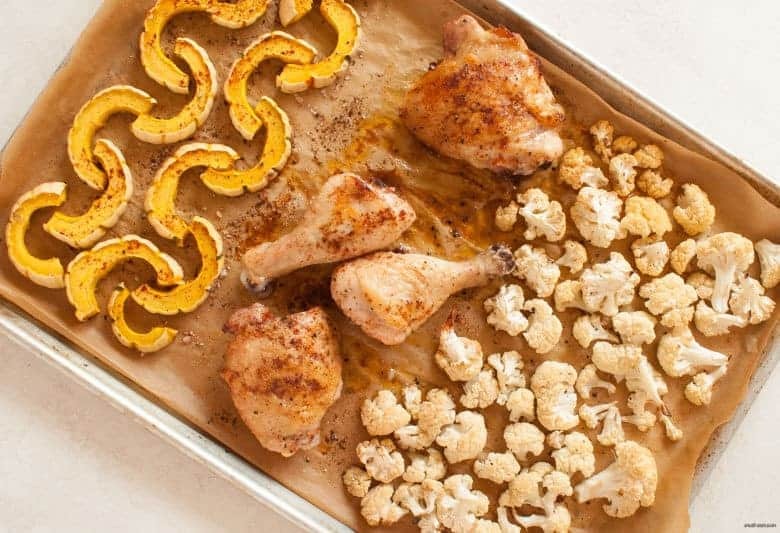 This Fall Chicken Sheet Pan Dinner is an easy way to prep and create a simple and nourishing meal for any night of the week. Like the Salmon Sheet Pan Dinner, making this meal is beyond simple. Cut up the veggies, arrange them and the chicken on a pan, season, bake and you’re done. You can change up the seasonings to your tastes and if you want to jazz up your meal at all. Another great thing about the sheet pan method is that you can batch cook by adding in another sheet pan with the same ingredients. It will take the same amount of time and you can have multiple meals going in the oven. Depending the size of your sheet pan and vegetables, you may need an overflow pan for your vegetables, which is fine. You can have more veggies to enjoy for that meal, or you can use those in other meals throughout the week. Try what works for you and what you’ve got on your schedule this season. You may not want to or need to do all of these tactics, and that’s okay. And if some of these work out, that’s even better! It is possible to cook during these times, it just looks a little different than most of the year could. And if you need to grab something pre-made on the way home, that’s okay, do what you need to do that will also make you feel good. See how you can balance that with other meals that can overall support your health. 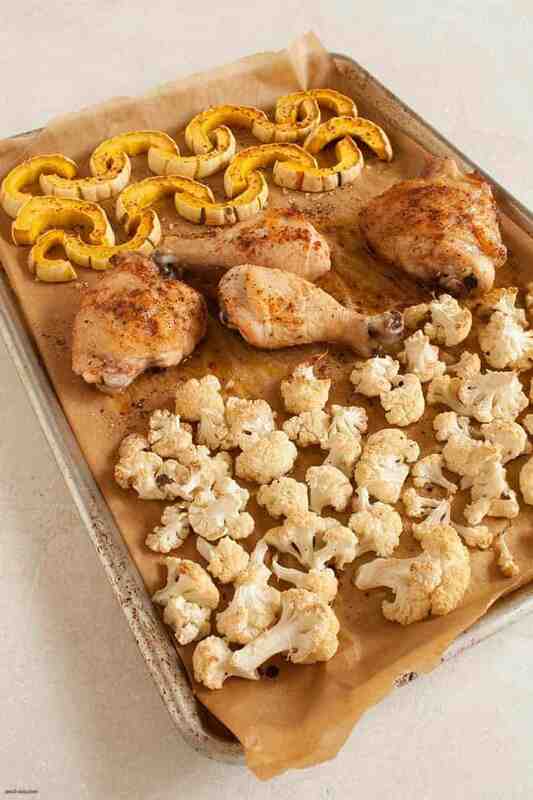 Line a baking sheet with parchment paper and rub the cooking fat of your choice on the parchment paper. 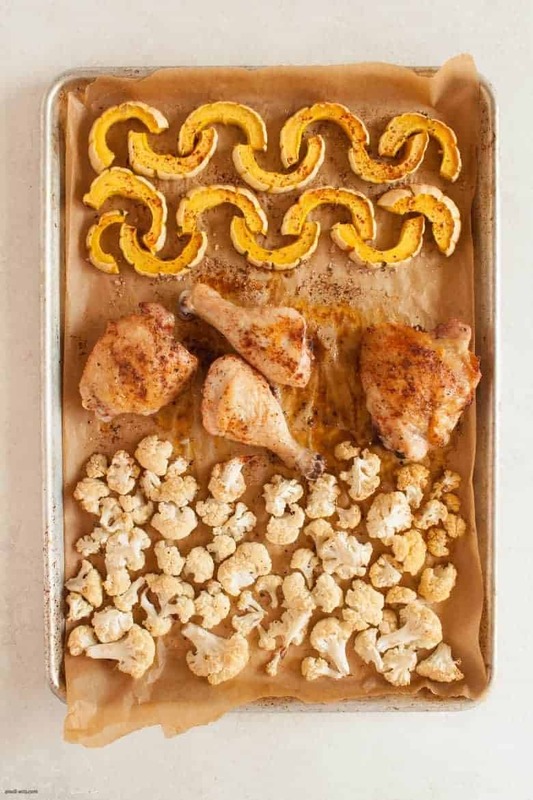 Arrange chicken pieces (bone side up), delicata squash and cauliflower on baking sheet and lightly sprinkle spices over everything. Bake for 17-20 minutes, flipping the chicken and adding some more spices to the unseasoned side. Cook for an additional 17-20 minutes. Allow to cool slightly then enjoy.